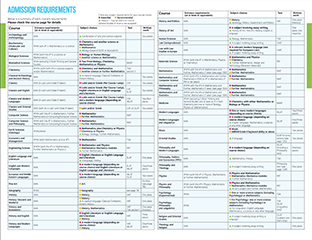 Below is a summary of the requirements for each course. See here for a b/w version of this table. Please check the course page for details. You can find details of all the alternative qualifications that we will accept on our UK qualifications and International qualifications webpages. Note: this table displays better in some browsers than others. If you have any difficulties viewing it, please download the adjacent pdf version. Read everything you need to know about applying to Oxford.